The Protek PL-5003S 50V/3A LCD Display Power Supply, part of the Protek PL-3003/3005 S/D/T Series, is a LCD Display Power Supply. The Protek PL-5003S adopts SMD adhesive sheet element technology. 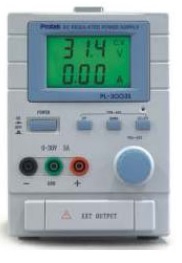 Additionally, the Protek PL5003S provides multi-loop type high precision voltage regulation as well as an automatic conversion of stable voltage and current.